"As of today, the smartphone platform has been on sale for exactly three months-long enough for things that felt like minor flaws at the time to develop into fatal, infuriating, carbuncles. I've been using it since launch on a range of handsets: how does it stack up now that the new gadget glow has worn off? Is it still a platform with promise, able to hold its own against the competition? Or are its widely publicized flaws and omissions crippling in longer-term use?" 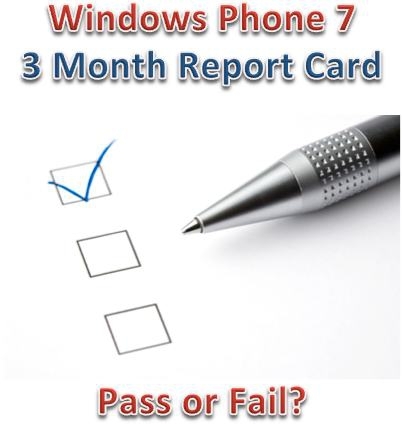 "Three months on, there's no doubt that Windows Phone 7 works well on a day-to-day basis. The interface and design aren't just eye-catching razzamatazz. They're well-thought-out, functional, sensible pieces of design, marrying form with function. The platform's beauty is more than skin deep". There's more to read, but what has caught my attention is that his experience has been mostly positive, and he clearly likes the platform after extended use. The Total exXperience Index reading for him seems to be trending in a positive direction. It will be interesting to read his thoughts after the first software update. I have to admit, after a couple of months of using WP7, I'm finding it much more straightforward and 'accessible' than either WM6.x or Android. (Sorry, haven't played with an iOS for any appreciable time). I actually only occassionally use the Bing search, but the couple of times I have, it seems to work pretty well. In general though, I'm constantly amazed how easy it is to do the common communication things I need to do each day -- through email, social media, etc. Everything just seems to fit together so well. My biggest 'sigh' is with the missing Tasks integration in Outlook. I rely so much on tasks to remind me, it's difficult not being able to see or modify them from the phone. (Yes, I know there are 3rd party apps in the Marketplace for this. Unfortunately, my corporate CIO sees no need to move to Outlook Server 2007 (yet), so I'm stuck for now. Both of my sons who have played with WP7 commented how 'smooth' the phone operated, compared to Android and WM6.x. According to them, it's not quite as intuitive as iOS, but it's pretty close. I love this phone (HTC Surround) way more than anything I have had or seen in the past. My friend has an iPhone, and after playing with it I would never switch. Seriously... what's with the inability to transmit the audio from a video file over Bluetooth? I can listen to music files or make and receive calls, but if I'm playing a video file, why do I have to use the plug-in headphones or speaker? Makes no sense. Some programs just won't run unless you have an active data connection... even if the core purpose does not involve downloading data. Probably the developer's fault, but you would think Microsoft would have some guidelines there. Why can't I use my own media files as ringtones or alarms? WTH? This is a *media-centric* phone, people. Or do you just not understand the concept? Why can't I *send* MMS on my WP7 *media-centric* phone? See above. Get those fixed along with the copy/paste issue and I'll be a happy camper.